Today’s killing of Osama Bin Ladan has for obvious reasons utterly dominated the press both online and offline. Filtering through the articles about the US operational details and political debate, I came across a Sky News article about a tweeter based in Abbottabad, Pakistan who unknowingly reported on the Bin Laden raid prior to it being completed, let alone reported on in the media. This was a fascinating story, not only because it provided a first hand report on the action as it unfolded, but also because it raises questions about Twitter’s impact on real-time reporting and security. Blogging and Twitter has given birth to churnalism, an incarnation of journalism in which press releases or other stories are used by mainstream media owners to create articles in newspapers, often in order to meet increasing pressures of time, which means their validity can remain unverified. 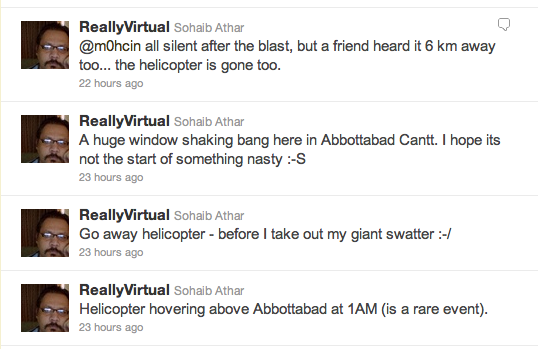 In the case of the tweeter ReallyVirtual, who was innocently tweeting about the US military operation nearby, his story wasn’t subject to churnalism as the events of the US raid in Abbottabad had been picked up by the media after it had happened, so the real issue here is whether or not Twitter poses more of a political and maybe military risk in such cases. This ties in with a blog I wrote yesterday about how our Internet vulnerability has reached an all time high, suggesting that while Twitter has its huge merits in catalysing political movement as seen recently in Libya, Egypt and less recently in Iran, it also poses a threat when time sensitive information is broadcast for the world’s eyes to see.